WASHINGTON CITY – City officials heard a presentation from the Washington County School District Wednesday concerning an incoming middle school and high school to be built in Washington Fields. Craig Hammer, Washington County School District executive director of of secondary education, addressed the Washington City Council about the project that will take place on a 60-acre parcel of land located on the south side of 4200 South at the intersection 20 East, st between 3430 East and Medallion Drive. The location is the future site of Crimson Middle School and Crimson High School, Hammer said. The middle school is anticipated to be open the fall of 2018, followed by the high school in fall of 2019. The middle school and high school have a capacity for 1,000 students and 1,500 students, respectively. The school district is continually keeping an eye on growth in the county, projecting where new schools may be needed. One of those areas is Washington Fields and the surrounding community. Crimson Middle School will share the same design as the three-story Dixie Middle School in St. George. 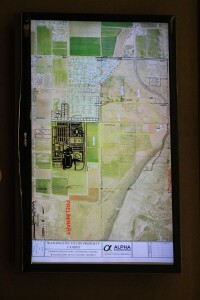 A design of the high school wasn’t displayed during the council meeting; however, Hammer said bids for the construction of the high school are anticipated to be sent out by late summer or early fall. Construction bids for the middle school are slated go out in April and awarded in May, he said. The two schools aren’t the only ones the school district has going up in Washington City. Construction has already begun on Majestic Elementary School on Washington Fields Road, Hammer said. Funding for the new schools and related facilities comes from a $185 million bond passed by voters in 2013. As to the costs of each type of school, Hammer said the school district figured on $70 million for the high school, $30 million for the middle school, and $8 million-$10 million for an elementary school. The school district has met with residents in the area and is doing what it can to be a “good neighbor,” Hammer said. A primary concern raised by area residents has involved potential parking and traffic impacts. During the council meeting, a number of Washington Fields residents living near the future site of the new schools expressed their concerns about traffic impacts on 4200 South, a road that many children use to reach nearby Crimson View Elementary. Some residents said they feel heavy equipment on the road during the construction phase — as well as drivers to and from the new schools — would pose a potential threat. “Particularly during the construction phase, there’s going to be a lot of traffic using that road at the same time our children are going to and from school,” one man told the council. There were also concerns about a main access route into the school campus via 20 East, which cuts through the Treasure Valley Road neighborhood located to the north of the new schools. Again, safety of the children in the neighborhood on 20 East during construction and as a result of regular student traffic afterward was brought up by residents. Residents asked the City Council if it could get the school district to have construction crews and resulting traffic somehow moved away from 20 East before it becomes an issue. Other concerns involved students parking their cars along the streets. Residents made requests for road signs indicating no parking during school hours and also potential enforcement of some kind. However, the point was raised that traffic in the area will likely increase regardless of the schools as communities in Washington Fields, Little Valley and the area around the Mall Drive Bridge continue to grow. One sign of this growth is the recent opening of a Lin’s Fresh Market on East Mall Drive that St. George Mayor Jon Pike said will likely serve students and faculty of the incoming schools. In addition to the incoming elementary, middle school and high schools, a new charter school called St. George Academy is also situated in the Washington Fields area and set to open in the fall. Ed. Note: The original address of the news schools’ location was posted in error has been corrected. I am having trouble accurately picturing the location for these schools. Perhaps Mr. Kessler can clear up my confusion? The article says the schools will be at 2000 S 4250 E. Then it says students of Crimson View Elementary use nearby 4200 E to get the school. But Crimson View is on 3000 E, just north of George Washington Academy. Is there an actual 4200 E in existence today? The article also says that the Treasure Valley neighborhood is just north of the new schools, though by street names it would actually be several blocks to the northwest? The best I can figure is that the new campus will be pretty much due east of George Washington Academy, just west of the Stucki Farms development. And nowhere near Crimson View Elementary at all. Yes? No? The general location of the school will be on the south side of the 4200 South intersection of 20 East, with 4200 South turning into 2000 South at the St. George/Washington City border. It is also set roughly between 3430 East and Medallion Drive. The Treasure Valley neighborhood is more specifically the Treasure Valley Road neighborhood that intersects with 20 East. Hopefully that helps clear this up. The original address of the school’s location was posted in error has been corrected.